SNAP I has a fossilised shark tooth pendant too! Today, I got two silver disk 3D foamy sticker things, stuck them back to back, drew my picto on the front and Run's on the back (it won't show because of the was the string's tied), added a layer of sellotape, pierced it, got some really cool bracelet string that is all silver and super stretchy, put it through the hole, added a few silver beads, tied a knot in the end, tied it to a hairband (will replace with a bracelet later) and put it round my wrist. 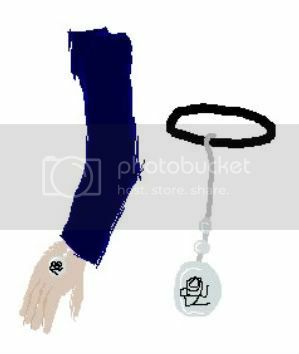 The upshot is that when I walk, you see a silver shiny disk with my picto on resting on the back of my hand, with a few beads above it (you cant see the band, it's up my sleeve). I have no idea how old! I guess I should, but I just know it looks really cool. I shall now attempt an MS Paint masterpeice. The blue thing as a sleve that I drew too short. The pink blob is a hand. The black scribble is my picto. ...actually, I don't think the picture helped much! Mine's about 50 million years old...it's awesome. I'm something that PREDATES THE EVOLUTION OF MANKIND. And it only cost six quid.